I’m currently attending Zaretta Hammond’s “Culturally Responsive Teacher’s Virtual Boot Camp“. 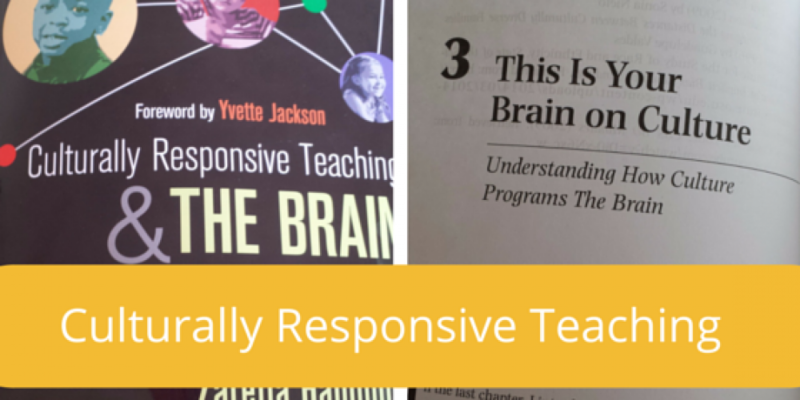 Zaretta is the author of the book “Culturally Responsive Teaching & the Brain” which I’m lucky to have come across recently. She has spent 20 years helping teachers learn to use equity-focused instructional “power tools” to support struggling public school students. As such she’s a fantastic resource of teaching tools and principles that I’m excited to apply in my ESL Yoga classes! The course consists of homework assignments, tasks for self-inquiry and teaching calls where I have the opportunity to explore my questions about teaching in a culturally diverse environment. The other participants are high school teachers, I’m the only one who is going to apply all cultural-responsive teaching tools to teaching Yoga. For the longest time I was looking for cultural competency trainings for Yoga teachers. But it seems these trainings exist only for the medical professionals, but not for Yoga teachers. (In case you know of a training or course in that field, please let me know!) I’m so glad to have found a book and course that apply to my work: teaching Yoga to students from different cultural backgrounds, because teaching Yoga to culturally diverse students requires a special skill set. In today’s coaching call we discussed the difference between stereotyping and learning to understand culture, and I’ve summarized my “Aha” moments in the infographic on the left. Especially interesting I find that stereotyping is a negative, quick snap reaction of the brain; understanding culture is part of a positive process – so it aligns a lot more with the principles of Yoga! The course consists of 6 sessions, so every week I’ll share some learning, so stop by next week!